1) Turn in your Notice of Intent (if your state requires one) – Get this done and turned in so you don’t have to keep it on your to-do list! It is SO important to get recharged. Make sure both you and the kids have stepped away from homeschooling mentally for a while. Also, be sure to get away from the house regularly (go camping, take day trips, use your town pool, go biking, canoeing, kayaking, roller skating… arrange for play dates that are NOT at your house). 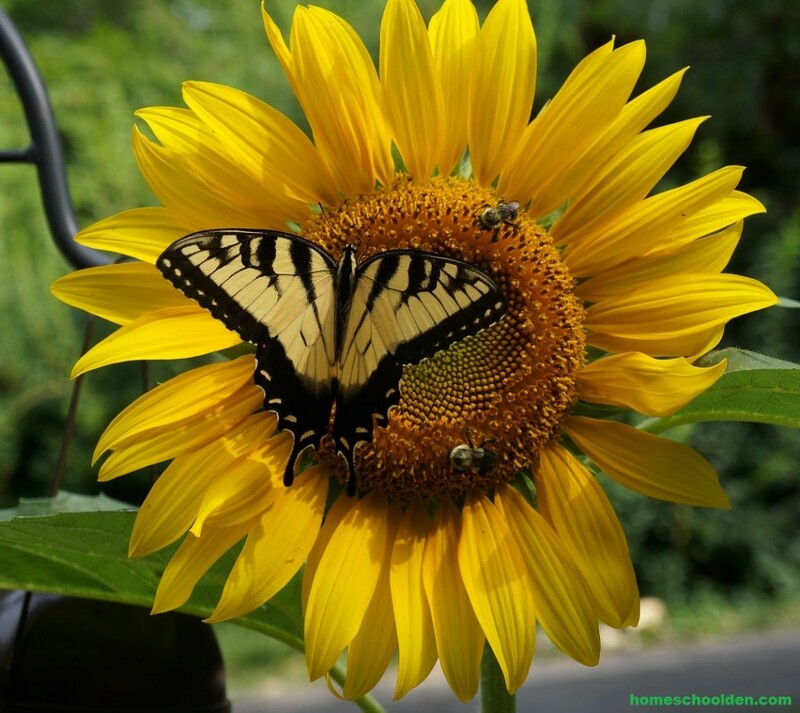 As homeschoolers, we spend much, much more time than average in our own homes, so leverage the warm weather get away from it all! As I wrote in a similar post two years ago, My 3 Rs: Re-Energizing, Relaxing, and Re-Organizing: I love our breaks! I really, really need time to re-group and get refreshed for another semester. This is probably as important a part of our homeschooling life as when we are going full-tilt with science experiments and history projects! Picture Courtesy of Wikimedia Commons, but doesn’t it just look like the perfect place to relax!!! 3) Get some of YOUR routines in place. School always goes more smoothly if we have routines in place, right? Take the summer to change things up and get things rolling smoothly even before the academic year starts back up again. What we do in the morning sets the stage for the rest of the day. You don’t have to get up early, but start thinking and working about your morning routine now. What do you need to do to get your mornings running smoothly this fall? Get into a good routine well in advance of school starting so once you add in the academics that’s just another piece that falls into the puzzle. Remember, it’s not just about getting ready and tackling chores; it’s also about being in the right frame of mind. Remember to include meaningful habits into your morning routine. Some people take time to write in a gratitude journal. Others spend some time reading or in prayer or meditation. 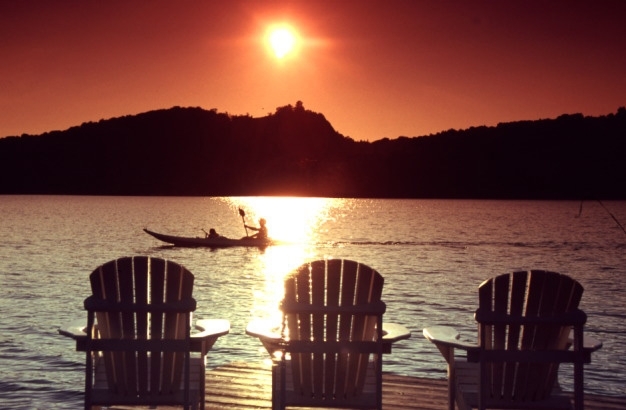 Take this time to clear your mind and feel connected and grateful for the new day ahead! Wondering about how to establish a good morning routine? You might want to check out the Morning Miracle (affiliate link) Hal Enrod or Flylady’s free morning routine resources. Both of these have been useful to me over the years as I work out my own routine. 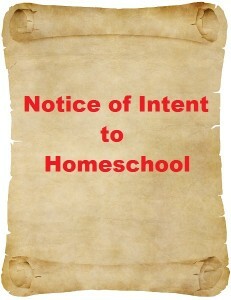 As homeschoolers we spend extraordinary amounts of time at home or heading out and coming back. As homeschoolers, there are three main things we need to keep on top of to help our house stay in some semblance of order: 1) Academic Mess 2) Dumping Grounds and 3) Daily Chores. Academic Mess: As homeschoolers we all have areas in our house where we have an “academic mess” of stuff… books, papers, workbooks that pile up and get away from us during the course of the day. Make sure you have a good system for making sure things get put away. 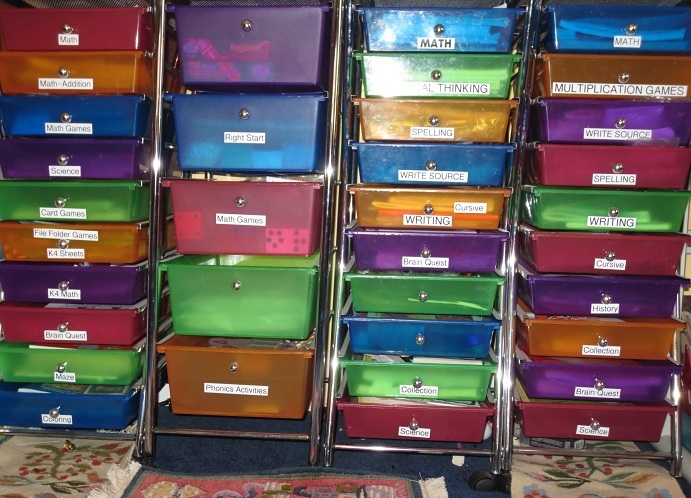 For along time we’ve used “workboxes.” Years ago I read Sue Patrick’s Workbox System, A User’s Guide. We bought three sets of plastic drawers (like these – affiliate link). It’s helped because the kids know where things should go. Now that the kids are older (and the books are bigger and heavier) they also have space near their desks where they place their literature or history books, but the point is, everything has a home – where it *should* go!! 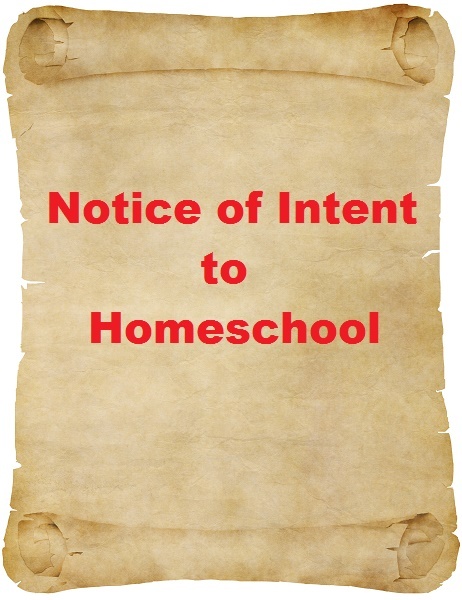 Dumping Grounds: Homeschoolers or not, we all have certain pain-points in our house… We have dumping grounds for bags/shoes that come in the door as we’re in-and-out, an area where we tend to drop mail as we walk in the door. Make sure you have a system and routine for keeping those areas under control. Can you re-organize those trouble spots?!! Do you have a plan of action for keeping those pain-points under control on a daily basis? Whether it’s a filing system or bins for mail or setting the timer to tackle those areas for five minutes, make sure you (and the kids) get into a routine to help those problem areas stay under control. Exercise: If you plan to continue your own exercise routine once the busy school year starts and activities pull you out the door, be sure you’ve got an *established* routine that you don’t even have to think about. Unshakeable: 20 Ways to Enjoy Teaching Every Day… No Matter What! (affiliate link) by Angela Watson — This is a book written for teachers, but I’m loving it and getting a lot of great take-aways! Anyway, The Element is a book written by Ken Robinson. It is talks about how important it is for people to find their element… the cross between natural aptitude and personal passion. It’s a book that really challenges you to think about what education is all about… How people can find where they feel most themselves, most inspired, and achieve at their highest levels. It’s a good read so far! I also have The One World School House (affiliate link) (by Salman Khan, founder of Khan Academy), Nurture Shock: New Thinking About Children (affiliate link) by Po Bronson, and Disrupting Class: How Disruptive Innovation Will Change the Way the World Learns in a pile by my bed. I’ll let you know how those are (someone else recommended them to me). Here are a couple of other education books that I’ve recommended before: Kim Bearden’s book, Crash Course: The Life Lessons My Students Taught Me (affiliate link) — and Teach Like a Pirate: Increase Student Engagement, Boost Your Creativity, and Transform Your Life as an Educator (also an affiliate link) by Dave Burgess as well if you want to be fired up as an educator. These teachers have taught me a lot about the importance of staying fresh and inspiring as an educator. **1) Did you enjoy this post? 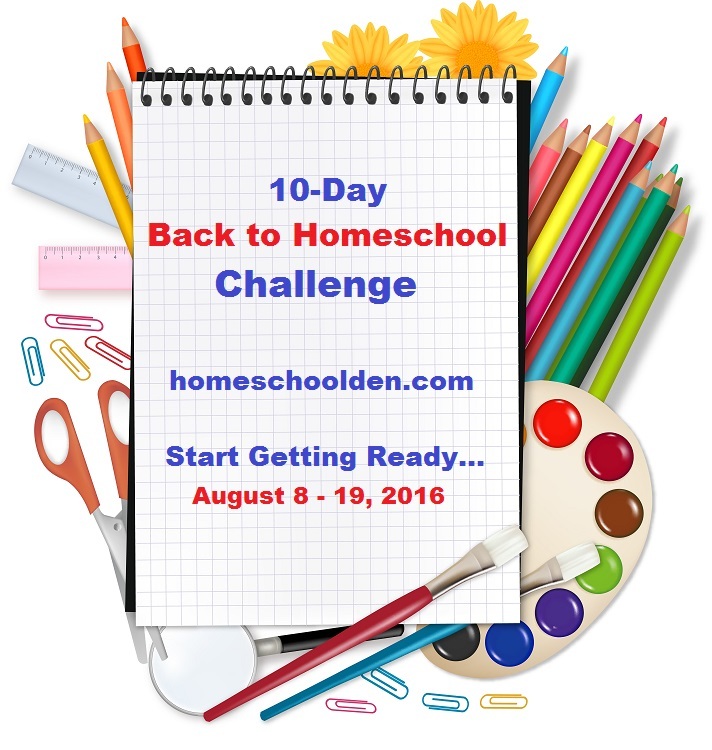 From August 8th thru August 19th get ready for your homeschool year with our 10-Day Back to Homeschool Challenge! Each day for those two weeks, I’ll have an activity or task for us to tackle to help us feel prepared for the school year to begin.